A new container crane has been assembled at South Port to cater for container volume growth. South Port chief executive Mark O’Connor said the company’s second crane ensured it could offer an industry best- practise service to container shipping customers. It also assisted to anchor the global shipping connection, he said. The company was also expecting the delivery of an additional toplifter container- handling forklift early next month, expanding its fleet to eight. The crane and forklift had a combined value of about $6 million. South Port operations manager Geoff Finnerty said the port invested in additional container handling equipment to ensure it had the capacity to cater for container volume growth. The new container crane, with a weight of 400 tonnes and lifting capacity of 100 tonnes, was the company’s second and a modern version of the first. The crane arrived in pieces by heavy lift vessel from the Liebherr manufacturing plant in Rostock, Germany, at the beginning of September. The heaviest piece was the undercarriage at 115 tonnes. 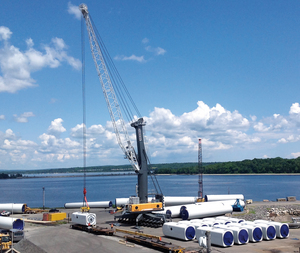 The company, along with a Liebherr engineer, then assembled the crane, he said. Four South Port representatives are going to Austria for training involving the maintenance and operating of the new crane, Finnerty said. The company had also increased its workforce to cater for the expanding requirements. The crane is undergoing testing and operator training at South Port and the company expected to start servicing container vessels with its two cranes by the end of October.